NO Not THOSE Dreams, this one was a different dream. I think I have a secret, unrequited, blogger crush. 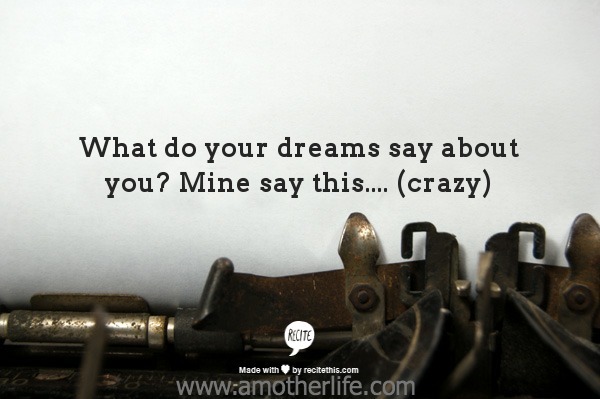 You know you have issues when you start dreaming about them. I woke up this morning and I remember everything. A sassy little redheaded blogger, the Hot Mess Mom , whom I love, came to New York, and wanted me to show her around! Of course I accepted the challenge. Wouldn’t you? Yeah I know, never gonna happen but it’s my dream ok… She wanted to buy some fresh potted herbs. I guess there’s a shortage in Florida. Whatever, it was a dream… So I took her to the outdoor Marquetta under the train tracks on 116th st in Harlem because everyone knows if you’re looking for ‘herbs’ in Harlem that’s the place to go. On the way, I summoned up the courage and asked, respectfully, if I could tweet that we were together, just those words…’shopping with the Hotmessmom.com’ made me positively giddy. She agreed, I wanted to share that I was super cool with all my followers. But I couldn’t get twitter to work, no matter how many times I tweeted, it wouldn’t go, it just sat there in the draft folder mocking me. We continued to shop. Then magically, like in all dreams, the Marquetta opened up in the lobby of a classy hotel. And there was a bar waiting for us. The focus zooming into the two vacant stools at the centre of the bar. It’s MY dream ok, just go with it….I asked her if we could take some selfies so I could remember the event, she graciously accepted, which of course she would, we were out ‘shopping TOGETHER!’ But my iphone was playing up. I had it round the wrong way and I fumbled, my left hand wouldn’t cooperate and I couldn’t take the picture. This sucked so bad, how would my peeps know I was out with her? It was so frustrating. All I wanted was proof that I spent the day with this awesome blogger and nothing would go right. It was like one of those dreams when you have to run but you can’t, no matter how hard you try. We finally decided to call it a night and as we were leaving the lobby of the hotel, the owner’s dogs came out to greet us.Trying to impress my Hot Mess Mom bestie for the last time, I decided to make friends with them. The three dogs came closer and as they did, the German Shepherd, the one with a wheelchair on his back legs, started growling and attacked me. I was attacked by a wheeelchair dog in my dreams while trying to impress a blogger whom I’ve never met that lives a dozen states away, I’m so ridiculous. We both have red hair, so that’s something right? I’m blaming her bottle….clearly this time it was more than a chance vodka was involved. Too funny! I hope it comes true! Well you never know! She did tweet and say for sure she’ll come see me in Harlem next time she’s here. But of course that could be lip service…Funny dream none the less. The good news, you live in a major city so she just may be in your neck of the woods one day. It would be a lot harder if you lived in oh, I don’t know South Bend, IN where no one goes to visit. But if you do, let me know and I’ll give you the tour of ND. Dreams just never go as you plan!! 😛 LOL!! It’s quite possible she will visit NYC so keep your fingers crossed!